Is Japanese Dock A Noah's Ark Or A Trojan Horse? About 100 tons of marine life rode aboard the huge concrete dock that washed ashore in Oregon earlier this week. Marine biologists were shocked to see that Japanese coastal species survived the trans-Pacific trek, but they are also worried about the risk for invasive species. Is Japanese Dock A Noah's Ark Or A Trojan Horse? 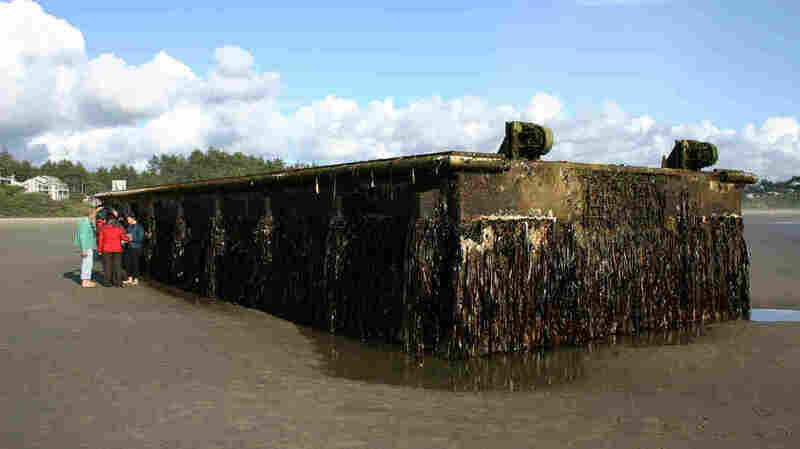 A bizarre event has drawn scientists to a beach in Oregon — a floating concrete dock from Japan has washed ashore. It had been ripped from its moorings by last year's tsunami and floated across the Pacific. 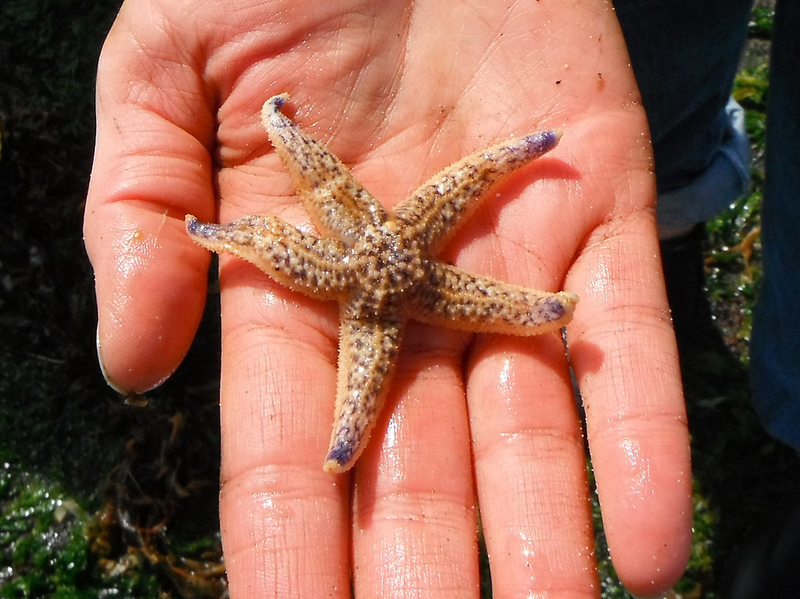 Among the creatures that survived the trans-Pacific trek aboard the Japanese dock was this sea star, which was found inside the float. The dock is encrusted with mussels, barnacles and other marine life from Asia. Scientists are amazed these organisms survived the 14-month voyage, but they're also worried some of these organisms could become pests in U.S. waters. Marine biologist John Chapman heard about the dock last Tuesday. It hit the beach a few miles from his laboratory at Oregon State University, and when he saw it, he was shocked. "There were just an amazing diversity of species that we have never seen before," he says. "And the massiveness of this thing — it's about a 100 tons of stuff. And it really does have millions of organisms and maybe hundreds of species." The dock is 66 feet long, 19 feet wide and 7 feet high; a plaque with a name on it revealed its source: a coastal town in Japan. 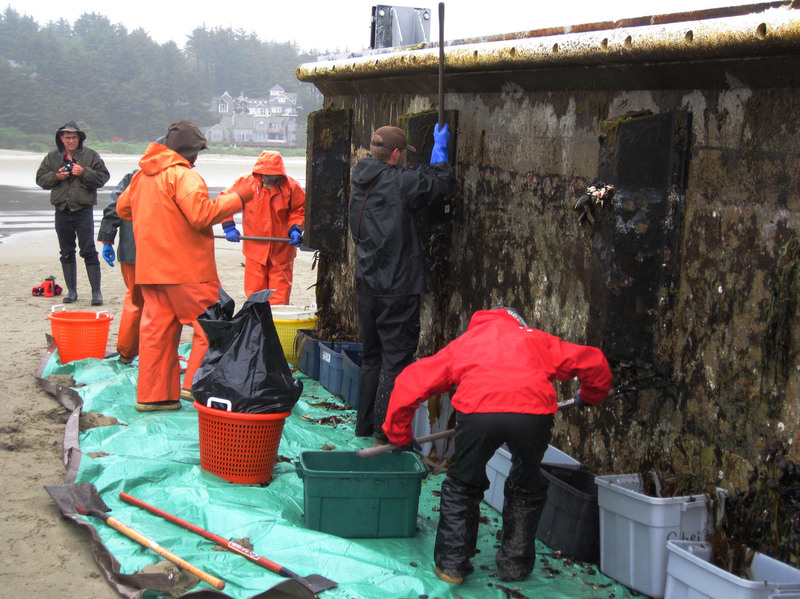 Chapman expected the organisms stuck to the dock would be deep sea species that hopped aboard during its Pacific transit. Japanese coastal creatures could not have survived a 14-month trip in the open ocean. But when he looked closer, he realized he was wrong. "You know, it's appalling to me that this artificial island of Asian species was ripped off of their shore and transported to here really intact, and that we would not have predicted that," Chapman says. "So what we thought we knew is wrong." Workers from the Oregon Department of Fish and Wildlife remove marine organisms from the dock. Marine biologist John Chapman says the dock may have carried hundreds of species and millions of organisms across the ocean. Chapman says nothing like this has ever happened on such a large scale. The dock was like a Noah's ark for all these local Japanese species. Or perhaps like a Trojan Horse. "There could be very bad things in there," Chapman says. "We already know of very bad disasters of introduced species." Zebra mussels from Russia have fouled the Great Lakes; in Oregon, the invasive oyster drill is a worm that threatens the oyster business. 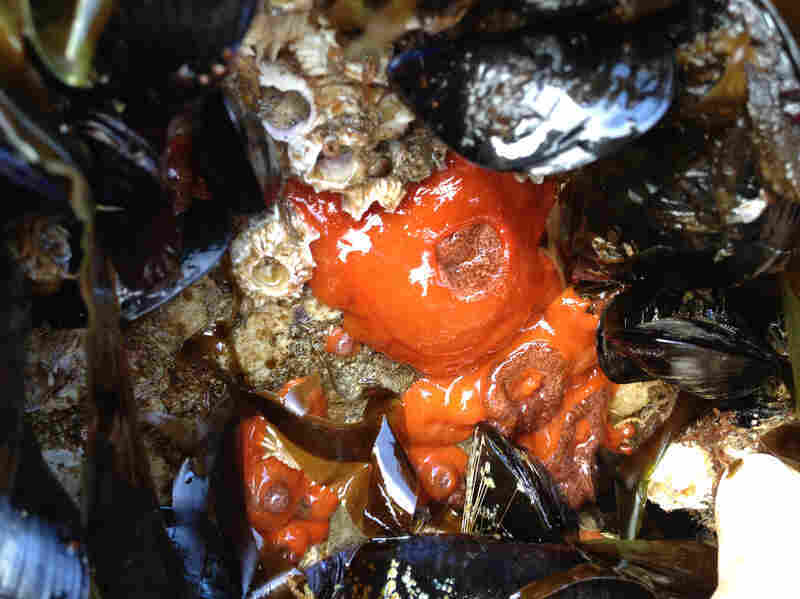 Chapman says non-native species are regular arrivals on the Oregon coast. But this is different. "It's as if we had this turnstile that would only let through one a year, and then you know, a stampede came," he says. In just two days of examining the dock, scientists have found a starfish that looks like one that has overwhelmed huge coastal areas in Australia; there are crab that look like one that's infested the East Coast of the U.S.; and there's a nasty species of brown algae all over the dock. Jessica Miller, an Oregon State University biologist at the site, says workers are trying to get rid of what they can. The dock was encrusted with mussels, barnacles and other marine life from Asia. Marine biologists were surprised to see that coastal creatures survived the trip in the open ocean. "The state hatched a plan which included this morning going out with a team to scrape most — as much of it as they could — and bag up as much as they could of the living biota and dragging it up the beach to reduce the risk that it might drift and float and settle somewhere local," she says. Unfortunately, whatever was growing on the bottom of the dock isn't there anymore. "When it got up on the beach, there was nothing left," Chapman says. "It all got ground off, which means that all of that was washed off in the ocean. It got away." University scientists are still trying to census this floating menagerie. But Miller says the team is also mindful of the event that brought it to Oregon. "A gentleman came up and put some white flowers in a crevice on the float and gave my intern a hug and then walked down the beach," she says, "really reminding us that yes, it's interesting scientifically, but it's only here because of a very serious devastating human tragedy."